OTTAWA – Civil society groups are calling for improvements in accountability and transparency at Export Development Canada as the government reviews the agency’s governing legislation. 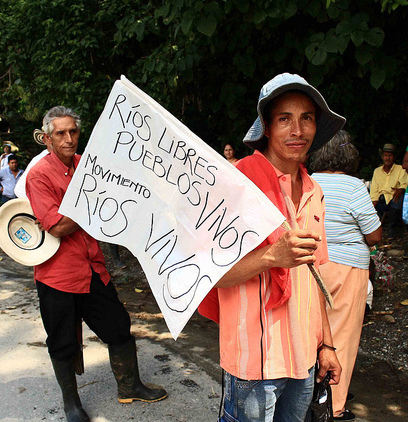 A protest against the Ituango hydro dam being developed by a client of EDC. The dam nearly ruptured this spring, forcing the evacuation of 25,000 people. Photo by Agencia Prensa Rural. Numerous EDC clients face allegations of wrongdoing, as detailed in a submission to the federal government published today by Above Ground. Most recently, South Africa threatened to halt payments to frequent EDC client Bombardier following a corruption investigation. Above Ground recommends legal reforms, endorsed by 16 organizations from across Canada, to ensure stricter oversight of how EDC handles environmental, human rights and corruption risks. Reforms recommended by Above Ground include prohibiting EDC from supporting firms involved in wrongdoing, subjecting it to judicial oversight and expanding the Auditor General’s mandate regarding EDC. Every ten years the government must review the Export Development Act and the mandate and activities of EDC, which issues over $100 billion in loans and other support to Canadian and foreign companies each year. Above Ground works to ensure that companies based in Canada or supported by the Canadian state respect human rights wherever they operate. It is a project of Tides Canada, a national charity dedicated to a healthy environment, social equity and economic prosperity.